Bun Hong and Kin Hong are Hung Gar Masters from Hong Kong. Both Masters have been teaching the Hung-Gar style for over 25 years. The history of the Hung-Gar style was so intriguing that both Masters Hong dedicated their life in promoting the art of the Hung-Gar style. They are both passionate in their teachings to students of all ages and nationalities. 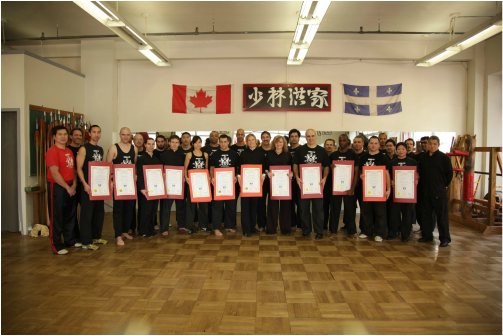 In their early years of promoting the art of Hung-Gar Kung-Fu, both Masters Hong have been involved in numerous demonstrations of Hung-Gar Kung-Fu in local schools, festivals in Chinatown Montreal, as well as in community centres around the city of Montreal, Quebec. Both Masters Hong first started teaching in local after-school programs, community centres, and the YMCAs. In 1983, they established their first school in the Snowdon district of Montreal. Since then, both Masters Hong have dedicated their lives to teaching full-time. The Master Kin Hong and Master Bun Hong have always emphasized on the objective of learning Kung-Fu which is to focus on health and developing the body, mind, and spirit. More importantly every student can gain self-confidence, respect for others, inner peace, balance and harmony in life. The people-oriented and passionate ways of Masters Hongs’ teachings to all their students have earned the trust and respect from students, friends, and the community. Presently, the Kung-Fu Sil-Lum Hung-Gar School has many dedicated and loyal students dating back to the 1980s. Some of the senior students are teaching in different cities across Canada and even in different countries. The new generation of Hung-Gar students will continue to train in the Hung-Gar tradition to carry on the legacy of Sil-Lum Hung-Gar. We owe our deepest respect to the late Grand Master Lum Jo, whose life time involvement in Hung-Gar has given the current generation of Hung-Gar Masters around the world, an opportunity and honor to pass on this ancient Kung-Fu knowledge to the future generations to come.